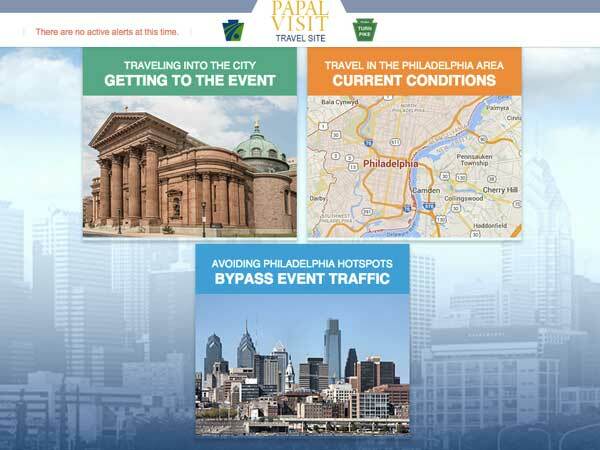 PennDOT and the Pennsylvania Turnpike have launched a website to provide real-time travel information about the state's highways for the upcoming papal visit. The site - http://papal511.com - provides details about planned closures, traffic conditions and directions to get to or avoid papal venues and other information. Maps show current road conditions and users can view real-time alerts about construction, lane restrictions, accidents and other incidents. The site was created for Pope Francis' Sept. 26 and 27 visit but is live now. PennDOT Secretary Leslie Richards said in a statement that travelers should use the site "to keep abreast of changing conditions during the visit." SEPTA also launched a new website related to the papal visit on Monday, with an interactive map for those planning to use Regional Rail during the pontiff's stay in Philadelphia. On the map, available at http://septa.org/fares/papal-map.html, users click on one of the 18 outlying Regional Rail stations that will be open that weekend. Users can than view a zoomed-in map of that station, which shows information like road and stairway closures, where riders can be dropped off and picked up, and whether amenities like portable toilets or bike racks are accessible. Philadelphia is using its 511, or Traveler Information System, to help motorists know where to avoid during His Eminence's visit. This constitutes a good practice.